If you would like to hear more about my experience with medication check out the podcast episode below. I am always hesitant to speak about my experience with anti-depressants on the internet. 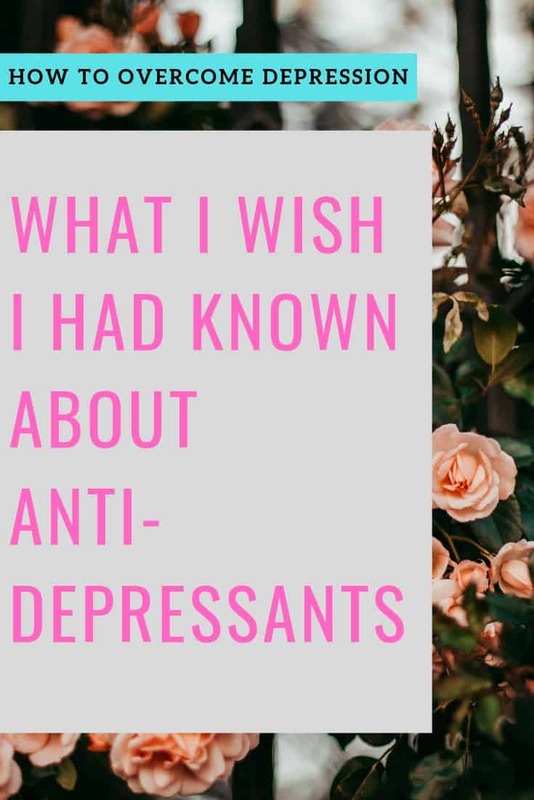 I know everyone’s experience with medication is different and some people have terrible side-effects or don’t feel like themselves when they are on anti-depressants. In the seven years I’ve been on anti-depressants I have been blessed enough to not have these experiences. To be honest with you it makes me hesitant to speak honestly about my experience with anti-depressants because I don’t want to glamorize anti-depressants or make it seem like I believe you have to go on medication to recover (I don’t). However, I do believe it is the right solution for me and that it is the right solution for many other people as well. Before I went on anti-depressants I thought I was a naturally negative person. I believed that it was normal to feel achy and tired all the time. I thought that I was lazy and unmotivated. I didn’t understand that there was any other way to live life because I had been depressed for as long as I can remember. In fact, some of my most depressing journal entries were written when I was a child. The medication made so many things possible for me in life and taking anti-depressants opened so many doors for me. My relationships were better, I was able to finish my Master’s degree and travel all over the US. I’m so thankful for these experiences and I know they wouldn’t have been possible without taking medication for my depression. Over the last year, I’ve been feeling really great and I’ve been happier than I can ever remember being. I started to question if I really needed to be on anti-depressants anymore. I had done so much therapy and inner work and I felt like I could manage my depression without the help of medication anymore. So I did the responsible thing and quit taking my medication cold-turkey (this is sarcasm-DO NOT DO THAT). At first, I felt OK but as weeks passed my mental health began to decline and before I knew it I was in the middle of a depressive episode. I made an appointment to go to my Doctor and told him what happened. He helped me get back on my medication and at first I didn’t see any difference. I felt like my body had a weighted vest on all day and it was so difficult to do anything. I was desperate to feel inspired and energized again and it felt like I was never going to get better again. Eventually, the medication began to take effect and my symptoms began to improve. As I’m writing you this I feel so much better and more like my old self. I wanted to tell you this story to inspire you to talk to your Doctor about treatment options for depression if that’s something you’ve been thinking about. If you don’t want to go on medication there are other options for treating it but I urge you to reach out and try to find someone that can help you. If you want to go off of medication please learn from my mistake and make sure you talk to a Doctor so they can taper you off of your anti-depressants. I’m honestly a little embarrassed to tell this story because I feel like I should know better. However, I know there are other people who are tempted to do the exact same thing when they feel like they don’t need medication anymore. I hope this story will prevent someone else from going through a low point the way I did. I wasted so many years of my life feeling like total crap instead of talking to my Doctor. I just accepted that life was hard for me and labeled myself as lazy. When I talked to my Doctor they ran a bunch of tests and found out I had a bunch of vitamin deficiencies but I was extremely low on Vitamin D. I knew I should talk to a Doctor for years before I ever did but I was scared and I didn’t really know what to say. I’m so glad I finally got the courage to say something and talking to my Doctor really changed my whole life. Finding a good therapist that you work well with can be a tall order. I suggest finding someone that specializes in the areas you want to work on. The first therapist I worked with specialized in anxiety and helping people overcome panic attacks which was what I was struggling with at the time. There are therapists that specialize in everything from trauma to healthy relationships. It took me a few tries to find the right person to work with but I am so glad I did it. Now I use BetterHelp to talk to a therapist via Skype which works a lot better for me when I’m traveling or staying with family. After struggling with depression for over ten years I was used to drowning myself in negative thoughts and messages all day. I started listening to a ton of audiobooks and podcasts and it has really helped me change my mindset and perspective. My self-talk was so negative just hearing some positive messages throughout the day really helped me and made a big difference in my mental health over time. I know it’s annoying to hear someone tell you to exercise with you’re depressed but it really works. Even though I take medication I still exercise most days because it makes my depression so much easier to manage and makes me feel so much better overall. I have a video all about how I use exercise to manage my mental health you can check out below. 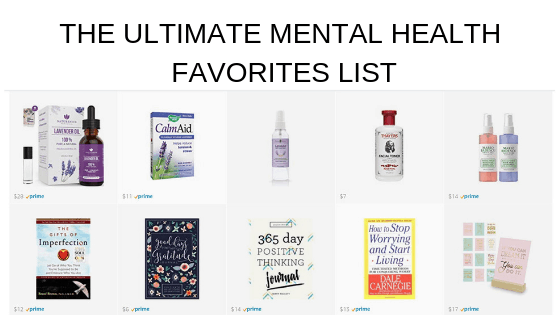 If you’re looking for more resources to help you cope with depression be sure to check out my other blog posts here and subscribe to my mental health podcast. I 100% agree with you. They have saved my life. I’m more healthy now that I’ve ever been. I was hesitant at first too but I’m glad I stuck to them.